With the New Year upon us, it's open season for technology predictions. Here are a list of my top ten predictions for the mobile & technology industry, including a few that I've made over the past 10 months. 1. Android tablets overtake iPad's market share - Lower price points will drive mainstream tablet adoption across the globe, helping Android tablets overtake the iPad's market share by Q2 or Q3 of 2013. However, this dynamic will be driven by stronger growth across diversified price points and not a drop in iPad or tablet demand, i.e. Android tablets will claim a larger slice of an expanding pie. 2. iPad Mini becomes most popular iPad model - A lower price point will also help global iPad Mini adoption. The iPad Mini will end the year as the most popular iPad model driven by higher global awareness about the product category. Unfortunately, this would also cause considerable cannibalization of larger iPad models. 3. Apple begins transition to a semi-annual product release cycle - Apple is well aware of the fact that its revenues are incredibly cyclical, driven by its annual product launch schedule. Moving to a semi-annual product cycle would help in stabilizing revenues and reducing volatility in its stock. Apple has already hinted at moving to a semi-annual product cycle with last month’s iPad Mini & 4th generation iPad launch. I expect Apple to maintain the iPad's semi-annual product cycle and also begin using the same approach with the iPhone. 4. Apple's rumored iTV does not hit the market, disappoints "cheerleader analysts" - Over the last few years, there have been numerous rumors of Apple's intentions to enter the TV market. Unfortunately, the rumored iTV will not be launched anytime soon. The reason I think this will only disappoint "cheerleader analysts" is because other analysts understand that an Apple HDTV would be priced too high to make much of an impact on the market or on Apple's financials. The only way an iTV can be a mainstream success, is if Apple succeeds in getting cable providers to subsidize the product, and that is something they don't seem inclined to do. 5. Apple remains at odds with China Mobile - China Mobile's government control will push the carrier to play hardball with Apple. Apple would resist any proposal involving a profit-share and China Mobile is unlikely to give in to subsidy Apple's demands. 6. Windows 8 further extends already extended PC replacement cycle - Smartphones and tablets have already extended the PC replacement cycle and mitigating this risk was part of the rationale behind Windows 8. Unfortunately, the unfamiliar interface, high cost of touch PCs and lack of touch-optimized applications will create a PC sales crash, as replacement cycles get stretched even further. 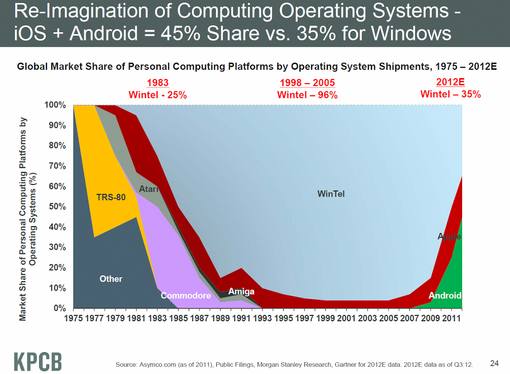 As a result, WinTel's "connected device" market share will continue to drop. 7. Windows 8/RT remains irrelevant in mobile - In the mobile space, Windows 8/RT devices will remain handicapped because of high prices, lack of a large application base and weak OEM support. The problem is very similar to the issues faced by Windows Phone in the smartphone market and are driven by a late entry into the industry. Even the Microsoft Surface will continue to see low demand and the confusion between Windows 8 & Windows RT will make the problem worse. 8. Windows Phone & Lumia sales remain muted - Nokia's bet on the Windows Phone platform will remain fruitless as the Lumia 920 will fail to create a sizeable market for the platform. Nokia & Windows Phone will begin to generate some interest in emerging markets, but it will happen too late as low-priced Firefox based devices overtake them in those regions. 9. Blackberry 10 fails to revive RIM - RIM adds another failed platform to the list as Blackberry 10 will not be enough to win back former RIM customers. RIM will also continue to lose more enterprise customers as the BES incompatibility issue rears its ugly head. 10. Google's mobile advertising revenues surge as tablet adoption rises - The surge in tablet adoption will help put Google's advertising revenue growth back on track. Cost-Per-Click (CPC) rates and the number of advertising slots in smartphones are much lower than on PCs, while those on tablet devices are comparable. As a result, the rise in tablet adoption will lead to a surge in Google's mobile advertising revenues and will begin to make up for slowing PC advertising revenues. These sound more like predictions for 2012. Apart from the ones about China Mobile and the iTV, i'm not entirely sure how. I guess there's nothing outlandish here because I don't believe we're gonna see any major acquisitions just yet. Android tablets are going to surpass the iPad market in nest few months. I am not sure about the BB10, may be it will become good device and surpass the windows mobile phone market. It's entirely possible that Android tablets overtook or came close to overtaking the iPad in the last quarter. I see Q2 to Q3 as a worst case scenario. In any case, the next couple of quarters will be interesting.